Velocity Paragliders USA proudly introduces the NEW Elektra Paraglider! Velocity Paragliders always provides customers with exactly what they ask for… In this case, “a high-performance crossover wing that will fit the needs of both motored and free flight pilots. 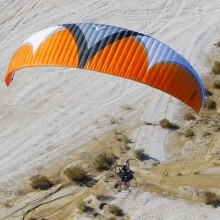 The NEW Velocity Elektra Paraglider was introduced in 2013 at the BlackHawk Salton Sea Fly-In. Pilots were eager to test-fly Velocity’s latest technology and were lining up to do so. Over the months that followed, the Elektra Paraglider became the TOP best-selling, and most sought-after glider in it’s class, for both beginner and advanced pilots. World-class free-flight and motored pilots from around the globe are raving about the Elektra’s uncanny lift characteristics, one of them stating “It’s the closest feeling to free flight I’ve ever experienced with a motor on my back!” As a standard with Velocity products, safety is never sacrificed for performance when a Paraglider is designed. The new Elektra Boasts an amazing 9.4:1 glide ratio. This allows motored pilots to use less fuel, free-flight pilots to stay in the air longer, and reduces the overall wear & tear on an engine. The Elektra is manufactured to the highest-quality standards from the lightest, most durable materials available in the Paragliding industry. Additionally, the Elektra Paraglider costs over $1000 less than most comparable gliders on the market! Middle-man and import costs are eliminated by Velocity Paragliders USA producing all their own gliders. Order yours today and join the growing list of satisfied pilots! Click the button below to add the Velocity Elektra Paraglider to your wish list.